A list is a group of one or more contacts, identified by email. You can build a list by importing contacts from excel or copy/pasting emails ( see article), directly selecting contacts to be part of the list, or you can create sign up forms that allow your web visitors to subscribe to a list. The contact list is a key component in your marketing campaign process as it forms the basis of campaign recipients. A more few interesting characteristics about the list in ContactPigeon. This article provides the step by step guide of how to create and to modify contact lists. Step 1. From the left side menu options, select Contacts > Contact Lists. This brings you to a set of all visible lists you have within the platform. For new users, you will notice a few default lists - autoweb, My first list - that are part of the platform. Any visitor that joins through sign up and check out process will be added to autoweb. Step 2. Click on " New List" button to start a new list. Step 3. Enter the name and description for the list. Order: sorting order in which the list will be displayed. This is a numeric integer (0 to n) and used for ease of access and prioritization if you have multiple lists. Step 4. When you complete, click on " Save" to create the new list, or "Save and add contacts" to begin adding contacts right after creating the new list. 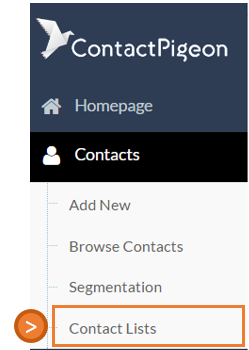 With ContactPigeon you can create both static and dynamic lists. For static lists, you have just to upload an excel file (.xls or .csv) with all your contacts. You can update this kind of lists manually, by uploading excel files with new information over time. Click on the "Build a New Segment" icon in the dashboard that appears after clicking on the "Save and add contacts" button in the previous step of contact list creation. Then you will land in the Segmentation section where you can create a dynamic list based on the criteria of your choice. You can find a detailed how-to guide in the article "How to set up a segment"
This section walks through the steps of editing a contact list (changing the list name, description, and sort order) and how to delete a contact list. Step 1. From the left side menu options, select Contacts > Contact Lists. Step 2. This brings you to a set of all visible lists you have in the platform. I.Name - List Names. This can be sorted alphabetically in ascending or descending order. III. Sort Order - Sorting order can be manually updated, by updating the Up or Down arrow, or within the List descriptions. Additionally, you can define the visibility of the list by clicking on "[Hide]" icon. If you are working with a large set of lists, moving some list to Hidden helps to reduce the number of lists without having to delete them. You can also use the Hidden function to avoid accidentally modifying or deleting critical lists. VI. Delete - Delete the list permanently. -- NOTE: THIS ACTION IS NOT REVERSIBLE!